Your existing router may not have Wi-Fi coverage for your whole home. The Gemini whole home Wi-Fi system can reach every corner of your house and builds a wonderful home Wi-Fi experience for you and your family. Always stay connected to the strongest Wi-Fi without buffering or losing connections. With mesh signal, family and friends can enjoy the mobility and convenience of Wi-Fi across your whole home. 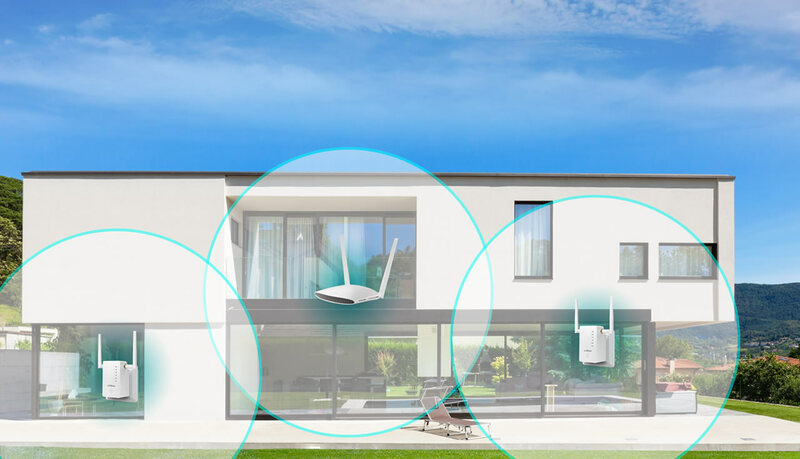 Gemini whole home Wi-Fi system is available in a range of packages that work for any home: one, one plus one, or one plus two Gemini devices. Expanded Wi-Fi coverage for any home. Two or three stories and lots of walls. Homes with brick, concrete or basements. Large, long or square rooms. Two-story homes with metal construction. Just launch Edimax iQ Setup from your smartphone and setup can be finished in minutes. Other Gemini devices will sync with auto-grouping, with no other settings required. Seamless roaming between Wi-Fi as you move around your home so there's no need to setup and connect to different Wi-Fi names for different rooms. The entire system uses the same single Wi-Fi name for your whole home. move room to room and need to switch Wi-Fi manually. and switches your device to the best available Wi-Fi signal. Supports auto-grouping multiple Gemini devices for easy setup and management. All of your iOS and Android devices can enjoy seamless roaming with one Wi-Fi name. The wire-free wall-plug design not only saves space at home, but naturally decorates your house. No need to make-do with your old 11n router. With Gemini devices, you can level up your Wi-Fi to the latest 11ac for super-speeds and high performance. Everyone at home experiences better streaming, gaming and 4K/HD videos. Gemini whole home Wi-Fi system improves Wi-Fi reliability at home for all popular smart home devices: smart plugs, home sensors or wireless cameras. And Gemini whole home Wi-Fi system makes the hottest home voice control services such as Amazon Alexa, work better. The Gemini whole home Wi-Fi system runs the latest 11ac standard for ultra-fast wireless speeds. Up to AC1200 or AC2600 is available, so you can choose the devices that are best for your home.